Banishing a weeknight dinner rut should earn a person knighthood, honestly. After all, it’s not easy to whip up daily entrees that fulfill the trifecta of healthy, easy to make, and tasty. Luckily, having wild-caught fillets of salmon, halibut, and cod on hand ensures that you can hit all three of these criteria each week. Here's our own no-frills recipe for pan-frying wild salmon that it literally easier than frying an egg. And this 5-ingredient recipe - using butter, honey, garlic, honey and soy sauce - has all your flavor bases covered. This recipe for salmon teriyaki comes together in under 20 minutes and is bound to please even your least fish-friendly dinner guests. P.S. : Don’t bother buying a bottle of teriyaki sauce. You can make much tastier one on your own with just a few Japanese pantry staples. A classic ponzu sauce, like the one in this recipe, tangy and with a bit of sweetness, brings out richness in roasted salmon and makes for an elegant-but-easy dinner for two. A top-quality piece of wild salmon makes for a phenomenal ceviche. You’ll have to plan ahead a little bit to get the fish just right, and it’s well worth the effort to make up a homemade batch of leche de tigre — “tiger’s milk” — to serve with the dish at the table. Halibut fillets, typically cut on the thicker side, are hefty enough to be stuffed with yummy condiments and herbs. This decadent dish of kale-and-pesto-stuffed halibut couldn’t be easier to make: just stuff and bake. Go ahead and make some extra pesto while you’re at it, because you’ll want to do this recipe again within the week. If you’re eager to fire up your grill for a quick weeknight meal, this recipe will do you just right. The freshness of chimichurri paired with the grilled goodness of a thick fillet of halibut elevates this recipe from delicious to gourmet. Spring flavors are the perfect co-star to pan-seared halibut fillets in this recipe, featuring a puree of fava beans and fresh mint. No side dishes required for this one. 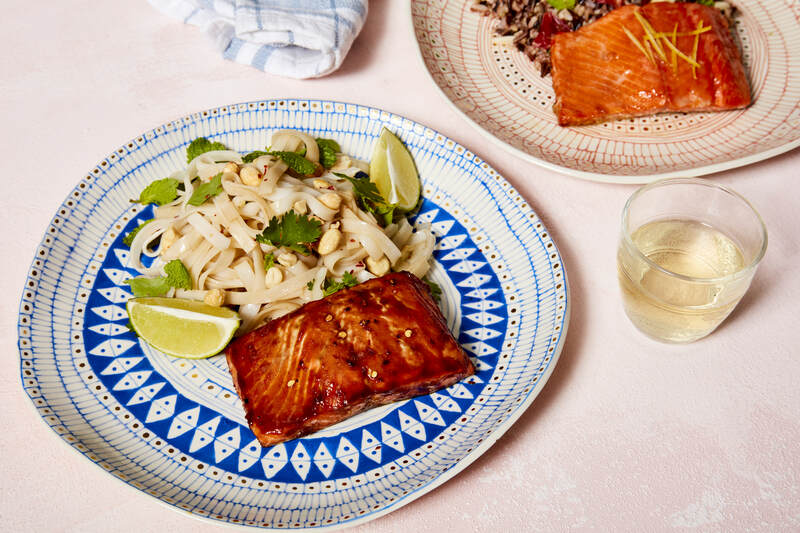 For a Vietnamese-inspired weeknight dinner, look no further than this fun dish of pan-fried spiced cod served over rice noodles. The flavors are complex, but clean and light. Even though you’ll have to make a few separate components of the dish — the fish, the noodles, the nuoc cham sauce — it’s worth the extra coordination. Mediterranean-spiced cod fillets, seared then baked in a cast iron pan, make for a rustic meal fit for a Greek seaside taverna. Don’t forget the lemon and olive oil… and a bit of butter to put the whole dish over the top. Poaching a fillet of cod is one way to preserve its luscious texture. In this recipe, cod is poached in milk infused with leeks, garlic, and thyme, and served with smashed potatoes..